The successful launch of Indian Space Research Organisation’s communication satellite, GSAT 29, from Sriharikota in Andhra Pradesh on Wednesday marks the completion of the development stage of India’s heaviest launch vehicle, GSLV Mark III, referred to as ‘Bahubali’ because it has double the carrying capacity of its predecessor, GSLV Mark II. It will now be part of ISRO’s fleet of operational vehicles, which includes the highly successful Polar Satellite Launch Vehicle (PSLV). This is the second development flight of the Geosynchronous Satellite Launch Vehicle Mark III, which will be used for India’s human space flight programme scheduled for 2022 and Chandrayaan-2 in January 2019. “This was a very important mission regarding GSLV Mark III programme. 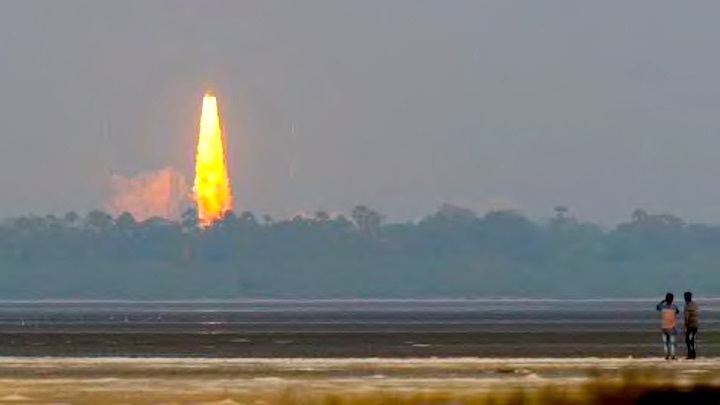 The second successive successful mission of the launcher clearly shows the launcher has completed the development flight and has entered majestically into the operational stage, along with the PSLV,” said ISRO chairman K Sivan. “It is also an important milestone of the Indian space programme towards achieving self-reliance in launching heavier satellites,” he said. GSLV Mark III’s first developmental flight carried GSAT 19 on board in June 2017. An experimental flight of the GSLV Mark III took place in 2014; it tested the crew re-entry module essential for a human space mission. The GSAT 29, weighing 3,423 kgs, is the heaviest to be put into orbit by ISRO’s launch vehicle. “My heartiest congratulations to our scientists on the successful launch of GSLV MK III-D2 carrying GSAT-29 satellite. The double success sets a new record of putting the heaviest satellite in orbit by an Indian launch vehicle. @isro” tweeted Prime Minister Narendra Modi. The GSLV Mark III has capacity to carry four tonnes into a geosynchronous transfer orbit, an elliptical orbit around the earth used to move a satellite between two circular orbits. The launch vehicle is also capable of carrying a 10-tonne payload to low-earth orbit. The vehicle is powered by two S200 solid motors, one L100 liquid core stage, and the third C25 liquid cryogenic stage. The satellite will be placed in the geosynchronous transfer orbit nearly 16 minutes, 28 seconds after the flight. The satellite orbit will be raised to the final circular geostationary orbit by firing liquid apogee motors in stages. The satellite will be placed at a 190 km perigee (closest distance to Earth) and 35,975 km apogee (furthest distance from Earth). The GSAT 29 is a multi-band, multi-beam communication satellite. It will carry Ka and Ku band transponders that will meet communication needs of people from hilly and geographically inaccessible regions in Jammu and Kashmir and the Northeastern region. The ISRO chairman had earlier said that the launch could be postponed if the weather was not conducive because of Cyclone Gaja. The Indian Meteorological Department had previously said that the cyclone was likely to hit coastal Tamil Nadu and Andhra Pradesh, including Sriharikota, from where the launch took place. The cyclone changed its course on Tuesday.